I read in yesterday's paper that we've experienced the wettest October and November in northern California in the last 30 years (for more on my direct observations of our autumn precipitation, go to "An October Like No Other"). This autumn has also been unusually warm here - we didn't have our first freeze until well into November (in the 15 years we've lived in Auburn, we've usually had a hard frost by Halloween). The combination of moisture and warm temperatures has made the grass grow - I can't remember another fall like this one for grass growth. 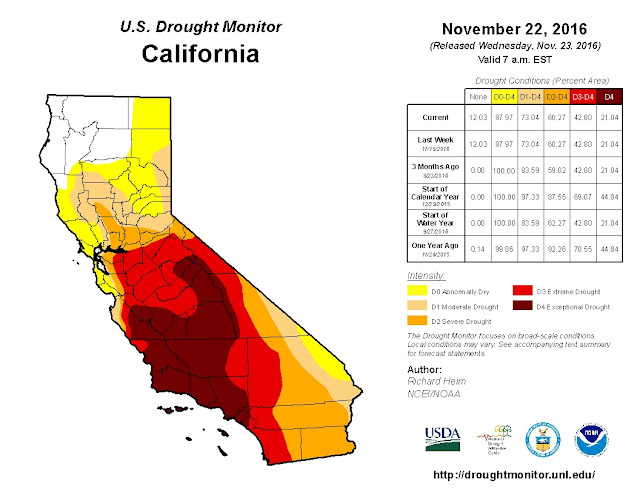 But as the article in the paper explained - and as the drought map below reinforces - we're still in the midst of one of the longest droughts in California history. Our portion of western Placer County has improved (we're only in "moderate drought" at the moment), but other parts of the state (especially the southern San Joaquin Valley and the central coast) remain extremely dry. 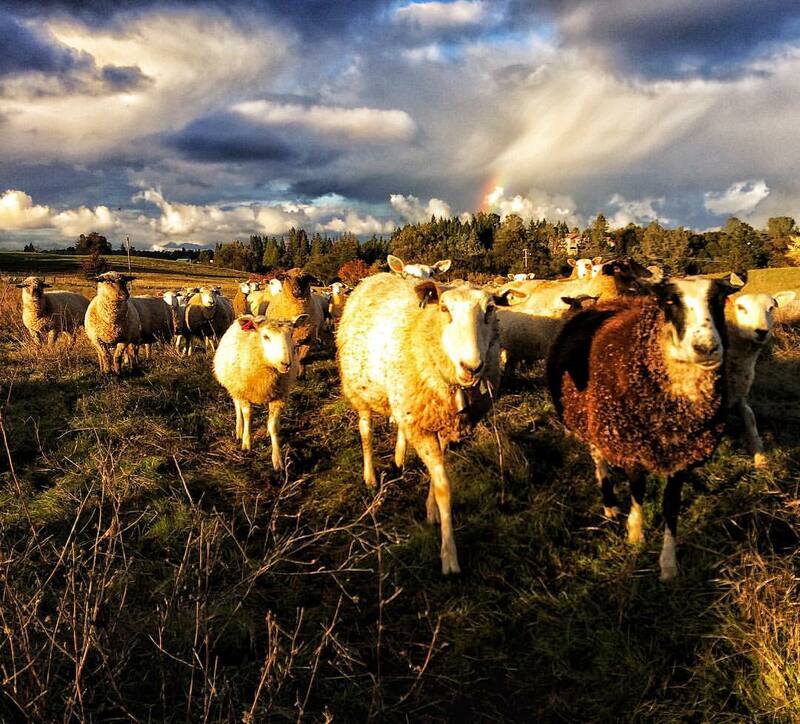 On our Sierra foothill rangelands, we typically go through two dormant seasons in terms of forage production - you might think of these as grass "droughts." Since our forage plants (grasses and broad-leaf forbs) are mostly annuals, the first of these dormant seasons is obvious. The golden-brown grasses of our California summers represent the annual warm season drought in our Mediterranean climate. This dry forage doesn't have enough protein in it to support our sheep - which is why we either supplement their protein intake or move them to irrigated pasture. The second dormant season is less obvious. At some point (usually in late November or early December) the shorter days and colder temperatures put our newly germinated green grasses into dormancy. With the sun at a lower angle in the sky, the soil doesn't absorb as much heat - once the soil temperatures drop below 50 degrees F, grass growth comes to a halt. I checked the soil temperature reading for this morning at the California Irrigation Management Information System (CIMIS) weather station near Auburn - we're at 52.5 degrees. In other words, we've just about hit our winter grass "drought." Our job now is to ration the grass that's already grown this fall until the days get long and warm enough to get the grass growing again (usually in early March). In the meantime, I hope the precipitation keeps coming. Continued rain in the foothills will help maintain soil moisture and replenish springs and creeks. Continued snow in the mountains will help ensure that we have stored enough water to keep the rivers and irrigation canals flowing next summer. And to paraphrase my friend and fellow rancher Tim Koopmann, the spring rains make the year! Keep it coming!